Galveston Island has long been a premier Family Spring Break Destination. With such a close proximity to the major Cities of Texas – Houston, Dallas, Austin, San Antonio, College Station and more – Families from all over come to Galveston for their Spring Break Vacation. Mild Temperatures, Beautiful Beaches, Museums, Space Center Houston, and our absolute favorite – Fishing in Galveston! With so many species to fish for and catch – it is no wonder Galveston is known as a Fisherman’s Paradise. 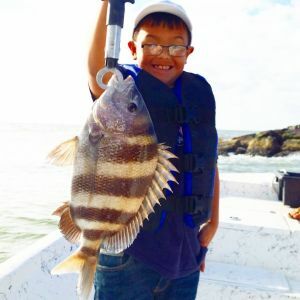 Bay Snapper, Black Drum, Bull Reds, Speckled Trout, Red Fish, Flounder, sharks, and more make Spring Break Fishing in Galveston second to none. End of February marks a very exciting time of year for our Galveston Fishing Charters. The annual spawning activities of two very fun fish – the Bay Snapper (sheepshead), and the Black Drum. The Bay Snapper begin migrating to the jetties and bays to spawn, and we love to target these tasty eating fish. They can be relatively easy to catch (with the right direction) – and great fun for kids and adults to hook into and battle. We generally use spinning tackle, spooled with 12 lb test line, a #1 J hook, and very little weight. Live shrimp is the bait of choice for these tasty Snapper of the Bay. Our Galveston Fishing Guides will have you hooked up on your Galveston Spring Break Fishing Trip. As we fish for the Bay Snapper, it is very typical to also catch speckled trout, redfish, black drum, pompano and more. The great thing about Spring Break Fishing in Galveston is you just never know what you may catch! After we fill the cooler up with some great tasting fillets – this is a great time to move off into a bit deeper water and fish for the spawning Giant Black Drum. This is what Galveston natives call the “Drum Run”. These humongous, power houses will give you the workout of a lifetime as you battle these beasts to the surface. 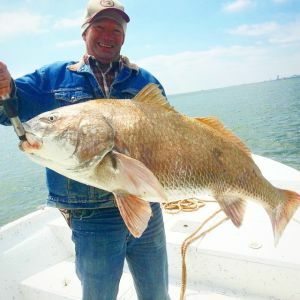 From 15 to 40 plus pounds, catching a Giant Black Drum should be on your to do list for your Galveston Spring Break Fishing Trip. We will be running two trips a day – morning and afternoon. 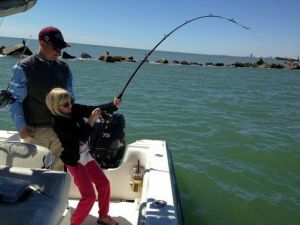 Our Family Friendly Galveston Fishing Guides are lifetime natives and anglers of Galveston Bay, and you can be sure your family will in the right spot at the right time. We also have lodging available nearby in Freeport, Texas. Bay’s Landing is just over the bridge on the Mainland – and with a price that won’t break the bank – the waterfront lodge is sure to make your Galveston Spring Break Vacation great. 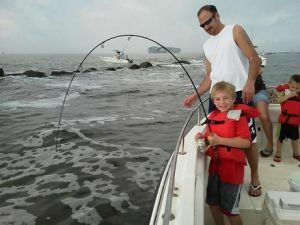 All of our Captains are Kid Friendly Fishing Guides, and love to get kids hooked on fishing! Give Captain Greg a call or text at 409-739-8526 for questions or if you would like to know our availability.